Musical information is recorded in the horizontal direction on mono records. Tracking the vertical elements will only lead to extraneous noise or potential damage of the record groove. Given this, the compliance of the XV-1s mono in the vertical direction has been set considerably lower compared to that of the horizontal direction. A somewhat "thin" and harsh sound is often experienced when playing a mono record with a normal stereo cartridge. A stereo cartridge picks up both the horizontal and the vertical groove information so that both the music and unnecessary noise are reproduced. 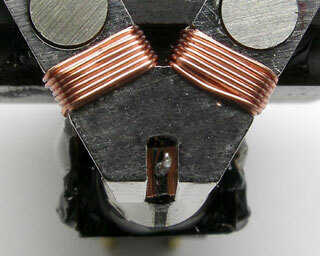 The corner of the coil bobbin (armature) of the stereo cartridge is oriented at a 45 degree angle to the record surface in order to pick up both horizontal and vertical groove modulations. With the XV-1s mono, the bobbin is rotated to be parallel to the record surface. Therefore, sensitivity to vertical modulation is reduced dramatically and horizontal modulation is converted directly to the desired electrical signal. This is the most important feature of the mono cartridge. A typical mono cartridge has two output terminals (hot and ground) with a single coil. The XV-1s mono has been designed with the four output terminals having bifilar wound coils. The bifilar wound coil means that dual separate monaural coils are connected respectively to the left and right channel terminals. As such, a typical stereo phono head amplifier/stereo phono preamplifier can be used as is without issues of hum, noise or ground loops. The magnetic circuit design of the XV-1s mono follows directly from the innovative XV-1s stereo cartridge. Ideal characteristics have been achieved through an unparalleled magnetic circuit featuring 8 Alnico magnet rods. The XV-1s mono also utilizes DV's flux damper (patent) that reduces magnetic distortion. This innovative circuit provides a presentation that is clear, natural and musically expressive like no other cartridge before. The cantilever assembly for the XV-1s mono is of solid boron with a line contact stylus profile, similar to that of the XV-1s stereo cartridge. A line contact stylus profile is unusual for a mono cartridge, but the depth of grooves remain constant on mono records and the shape of the groove on mono records is at the same average level found on stereo records. Properly implemented, a modern line contact stylus can be used with mono records with great success. As well, the XV-1s mono cartridge will not damage a stereo record due to it's moderate vertical compliance.